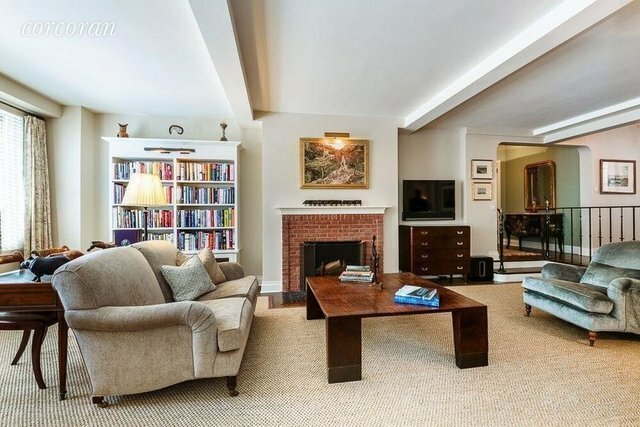 Located in one of the West Village's most sought after Bing Bing prewar condominiums, this particularly charming two bedroom and two windowed bath home has been completely renovated while maintaining the delightful prewar characteristics which are so admired in these boutique condominiums. The central West Village location is located within minutes of the Whitney Museum, Highline Park, Chelsea Market, Equinox Gym and hundreds of village cafes and boutiques. A perfect pied-a-terre or quintessential New York City home. A gracious entry foyer leads to an expansive step-down living room with a wood burning fireplace which is wonderfully sun-flooded throughout the day. The top of the line windowed kitchen has been renovated with new appliances and handsome marble counter-tops. The adjacent dining room with built in seating offers a cozy contrast and overlooks the living space. The master bedroom includes two custom outfitted closets and a beautifully tiled windowed bath. The second bedroom with windowed bath en-suite doubles as a wonderfully comfortable den and flows seamlessly to the living room through perfectly restored original french doors with original hardware. The apartment is complete with pristine hardwood floors throughout. 302 West 12th Street is a particularly distinguished and classic prewar doorman condominium built in 1931 by Bing Bing and designed by Emory Roth. Amenities include a marvelous decked and landscaped roof top terrace offering incomparable 360 degree views across New York City.